The Squadron, which has been in existence for over 60 years and is part of the Greater Manchester Wing Air Cadets and is currently operating from the premises of the 236 (Bollington) Squadron. It had to leave its home in Poynton earlier this year as a result of a lack of adult uniformed volunteers to help maintain its presence in the village. 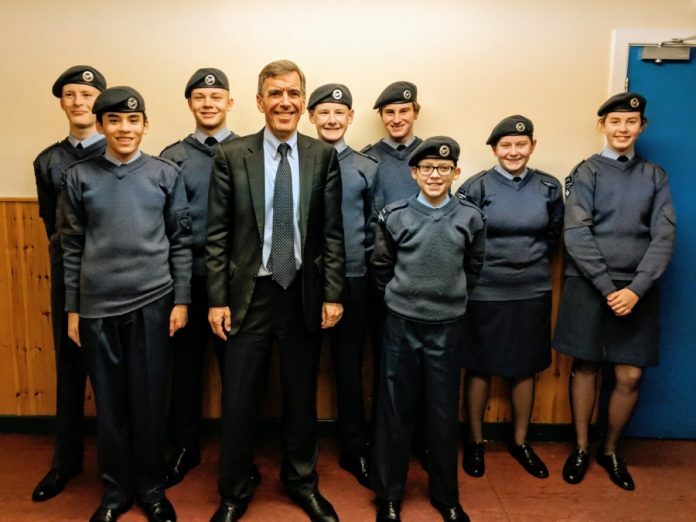 The Squadron has around twenty young cadets, all aged between 13 and 20, along with a smaller number of adult Leaders, who oversee the Squadron’s varied programme of activities. On his visit, David spoke with the adult Leaders and parents present, including Simon Brownbill, whose daughter is a member of the Squadron. They explained to David that there are many opportunities for adult volunteers to get involved, in a wide variety of roles, in supporting the exciting activities that the young cadets take part in, as well as helping to organise the Squadron’s regular participation in annual Remembrance Day parades in Poynton. David also spoke with the young people taking part in the programme and heard more from them about the many benefits they have enjoyed from being an Air Cadet. These include opportunities to experience new activities such as flying, gliding, target shooting, and class room activities, helping them to learn new skills that enable them to move through the rank and classification structure within the Squadron, starting as a junior cadet, and working up to Cadet Warrant Officer and becoming a Master Air cadet. 2448 (Poynton) Squadron currently meets every Tuesday and Thursday evenings at 7.00 p.m. in the Bollington Air Cadet Headquarters on Shrigley Road, Bollington, SK10 5RD.